The Silberkammer is the first part of the self-guided tour you can take inside the Habsburg’s winter palace. Though titled the Imperial Silver Collection, it’s actually a healthy mix of porcelain, glassware, linen, silver, gold and other household Habsburg items – particularly those from the 19th century and the rule of Emperor Franz Joseph. When you look at the displays, you begin to understand the sheer variety of dinner services and similar the court must have demanded. One service for breakfast, another for balls, another for the private use of Empress Elisabeth, another for Franz Joseph’s hunting lodge, another for state visits, etc. etc…. Throw in the gifts from foreign royals and you wonder if the huge size of the Hofburg palace might be due to the required storage space for soup bowls and fish knives. Right from the start, you can understand why Vienna is still riddled with confectioners – the first display of kitchen equipment features an awful lot of cake tins. Decorative stands for serving cakes, sweetmeats and candies pop up regularly: meat might be the main dish, but it’s pretty clear where the Habsburg heart lies when it comes to eating. Now I know why Marie Antoinette – born a Habsburg princess – said “Let them eat cake” (except she probably didn’t). Think a plate is just a plate? Something to eat off? Nope. Maybe a symbol of love or respect, as in Empress Elisabeth’s gift of a nature-themed dinner service to Emperor Franz Joseph for the aforementioned hunting lodge. Maybe a symbol of power and influence. If a king is popping round for breakfast, you need to bring out your best crockery – the image and status of an empire are at stake. And the best crockery does not come cheap. It costs money – money needed for the little expenses of Imperial life, like financing wars against Napoleon. The reason a lot of gold and silver items from the past are not on display in the Silberkammer is because they were melted down for funds. This indirectly led to the popularity of porcelain as an affordable alternative, although it was initially limited to soup and dessert courses. As you go round, look for all the historical glassware from Lobmeyr and porcelain from the Vienna Porcelain Manufactory. The former is still going strong, and the latter is the ancestor of the Augarten porcelain company (also still going strong – you might like their porcelain museum). Both have flagship stores on the Graben in Vienna’s city centre and are good sources of gifts or souvenirs of the upmarket variety. Anyway, so what are the highlights? As mentioned before, the Napoleonic wars wrecked havoc on the Imperial budget, forcing the Habsburgs to sell the family silver (literally). However, Napoleon’s eventual defeat did have some side benefits. The Grand Vermeil is a silver service plated with gold, first produced for the Court of Milan under French rule. Austria’s Emperor Francis 1 bought it up in 1816 and replaced Napoleon’s coat of arms with his own. By around 1850, Viennese artisans had extended the service to cover 140 place settings. When you have around 4,500 pieces in your dinner service, there’s never a panic if an extra guest turns up. But you don’t want to be the one doing the washing up. This is an unusual dessert service from 1824. The “ruin” plates are painted with Habsburg castles and fortresses, and the Gothic-style table centrepieces contain portraits of previous Habsburg rulers, like Albrecht 1, and their consorts. It reminds me of the latter part of the Kunstkammer collection, where there seems to be a strong need for physical expressions of political legitimacy. Was it arrogance? Propaganda? Simple self-indulgence? Or even insecurity? Emperor Francis I had given up the title of Holy Roman Empire only a few years previously, which was a knock to the Habsburg pride. A small vase of flowers isn’t going to impress the Tsar of Russia. Nor is a big vase of flowers, frankly. So the richly decorated pieces that ran along the centre of a table were a big deal for banquets. You’ll find these centerpieces throughout the Silberkammer, but the deluxe version is the Milan Centrepiece from 1838. This was used together with the Grand Vermeil dinner service and could extend up to 30m. That’s longer than the length of a basketball court. The (somewhat smaller) display in the Silberkammer gives you a feel for the grandeur of those state banquets. Also look for the bronze gilt French centrepieces from 1850/1851 – each a huge complex of figures, forms, scrolls and candle holders. In the kitchen and confectionery area, note how all the kitchen equipment is stamped with the double eagle and “K K” Imperial abbreviation. This discouraged stealing apparently. As you leave the kitchen area, look left to see photos of the staff at work, all “dressed up” in their caps and hats. In the old court silver and table rooms, look for parts of a dinner service used at the front, mainly made of alpacca (nickel silver) – a silver-coloured copper alloy better able to survive the rough and tumble of military life. The same area has an 1870 Minton dinner service made of English porcelain and featuring floral and animal designs (it’s the one Elisabeth gave to Franz Joseph for his hunting lodge). Below it you get your first glimpse of the Milan centrepiece. In the “court on the move” area, check the first cabinets for examples of the Imperial fold – a way of folding the napkin that is (still) only done for visiting heads of state. The folding technique is passed down orally and apparently only known by two people. Presumably they’re never allowed to travel in the same vehicle (or eat the same fish). This area also features some of Elisabeth’s personal crockery, like the dolphin-themed service used at her villa in Corfu. Note also the travel boxes, which were custom-built to ensure an exact fit for transporting dinner services. You can just imagine the servants opening each box on arrival with some trepidation, praying to any convenient God that everything is still in one piece. The remaining areas largely focus on porcelain and glass services, such as the Hungarian dinner service ordered by Emperor Maximilian of Mexico (Franz Joseph’s brother), but never delivered since he was executed in the meantime. Some more examples of napkin-folding mastery, this time Barock-style fish and bird shapes (if you want to try this at home, you’ll need bigger napkins, believe me). The 1814 gold service hastily purchased in time to impress those attending the Congress of Vienna that began late in that year and settled the future of Europe for decades to come. It’s porcelain covered in polished gold. Again, funding wars against Napoleon had seen the end of the previous gold service. Seems Napoleon had a lot to answer for. Meissen porcelain from 1775 – Germany’s Meissen was Europe’s first porcelain manufactory. Austria’s own Vienna Porcelain Manufactory was the second. A collection of Imari (far eastern) porcelain dating back to around 1700 and put together by Duke Alexander of Lorraine. In the Imari collection, also look for the personal solid gold cutlery set of Empress Maria Theresia, complete with its Imperial egg cup. Finally, there’s a Minton dessert service near the exit. This was a gift to Franz Joseph from Britain’s Queen Victoria, who bought it at the Great Exhibition in 1851. The service was so delicate, you couldn’t actually use it. So “thanks for that” the Emperor presumably thought. 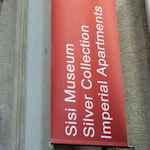 When you exit the Silberkammer, go up the stairs for the second part of your tour – the Sisi Museum.